Here at Maisie Jane’s we care a lot about bees because if it weren’t for bees, there wouldn’t be any almonds! 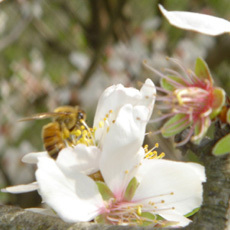 Bee hives are brought to the orchards during bloom to assist with pollination since almonds are not self-pollinating. The Zitlaw brothers own and manage the hives that we use to help pollinate the almonds we are selling to you, the consumer! Please enjoy getting to know Greg Zitlaw and gaining the knowledge he shares about bees. 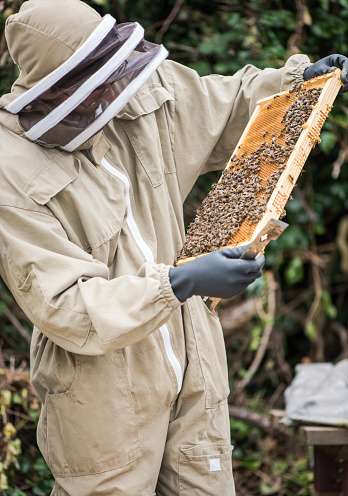 Why are you a beekeeper and how did you get started? I’m a beekeeper because I sincerely enjoy working with bees. They are fascinating insects both as individual insects and as a colony. My brother and I started the business in 2007 wanting to get back into working a profession that was agriculture related. We grew up on an almond orchard and our family has had small almonds orchards for four generations. We felt that beekeeping would be a great way to get back into it. Do you move your hives around? We do move our hives from “outyards” for almond pollination in January, then back to the yards where they remain until the next season of pollination. We have hives near Red Bluff, Corning, Orland, Dayton and Paskenta. We keep bees for orchard pollination and queen bee sales. How do you maintain your hives? What’s required? Hives are maintained when no nectar of pollen is available by supplemental feeding of corn syrup and pollen substitutes fed in patty form. Supplemental feeding is required after almond, prune, orange and blackberry blooms are finished where we keep our bees. Spring and fall mite treatments are required and treatment for other diseases takes place in the fall and winter as well. What are the most interesting things about bees to you? It is very difficult to isolate the most interesting thing about bees because there are so many fascinating aspects of bees. The simple fact that 30,000 individual bees can work together in such unity and harmony to carry out the day to day activities the colony needs is one of the things that amazes me the most. What are the different ‘bees’ in a colony? The different bees are the drones (males), the worker bees and queen bees. Drones live for eight or more weeks, queen bees can live up to several years, and worker bees live from four to six weeks. Most commercial beekeepers replace queens every year to ensure the colony’s numbers are maintained at high levels as younger queens tend to lay more eggs than aging queens. What’s the most rewarding thing about being a beekeeper? The most rewarding thing about being a beekeeper is seeing the end products of queen rearing efforts. To be able to work with the bees in every step of the development of queen bees is very fascinating. The biggest struggle with beekeeping is controlling a bee pest called varroa. It’s a mite that feeds off of the bee’s hemolymph (bee blood), weakening the bee and causing it to die prematurely. This causes the colony population to dwindle and if not caught soon enough, the colony will die as bees are dying at a quicker rate than they are being replaced. Varroa mites carry several viruses that further weaken bees as well. Anything else you’d like to share with consumers about your profession/bees? Don’t be afraid of bees. They are so busy doing their job that they will ignore you if you simply observe them and appreciate them for the industrious and fascinating insect that they are. At Maisie Jane’s we believe in taking care of our bees. With bees being such an important part of the human, plant, and animal life, we must pay attention to them because they are in danger. Maisie Jane’s California Sunshine Products, Inc. was founded on strong beliefs and passion for offering unique, flavorful, top-quality, almond products. We strongly believe in earth-friendly practices that start on our family owned and operated orchards. We use Organic farming practices and continue in the process by using all natural ingredients with no preservatives or GMO’s. We believe in honest, friendly and helpful customer relations at all levels. We take pride in every task, every day, with every person.